Nothing gets the point across like saying exactly what you mean. 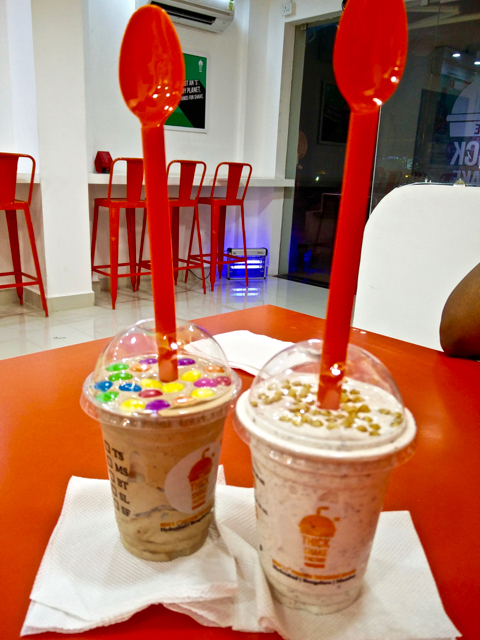 Thick Shake Factory does that and does that well. No distractions. Just thick shakes. No distractions in the name, the interiors or anywhere. 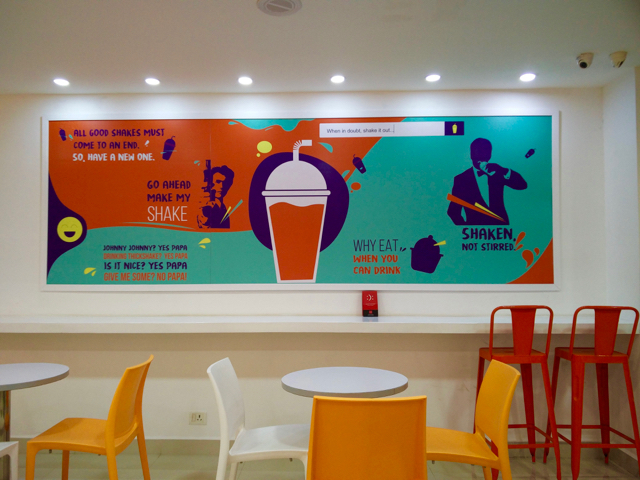 While the menu has sufficient variety, considering that these are just shakes, the possibilities are endless with Shape Your Shake. That is what we got two of. First, a chocolate base, Level 1 mix in was Choco Pie, Level 2 was Hide n Seek (the biscuits) and the topping was Gems. The second drink had a base of Hazelnut, Level 1 was Ferrero, Level 2 was banana and topping was butterscotch nuts. I know I got the gems topping but as I took my first sip, gems came through the straw. That for me was unbelievable. It wasn't just a topping, but had boatloads inside. The chocolate ice cream was the strongest and the choice-pie, the weakest of the flavours. Honestly, I couldn't taste any of the choco-pie. The second drink was similar with the Level 1 mix in. The hazelnut ice cream lent its nutty flavours, Ferrero was non existent and banana flavours shone through. Again, loads of butterscotch nuts that kept coming through the straw. The portion looked small, but was terribly a lot, simply because of the consistency. I won't be surprised if I held the cup upside down and nothing fell. It was super thick. We couldn't finish the drink and it doubled up as a post dinner drink the subsequent night. Priced between Rs. 140 and Rs. 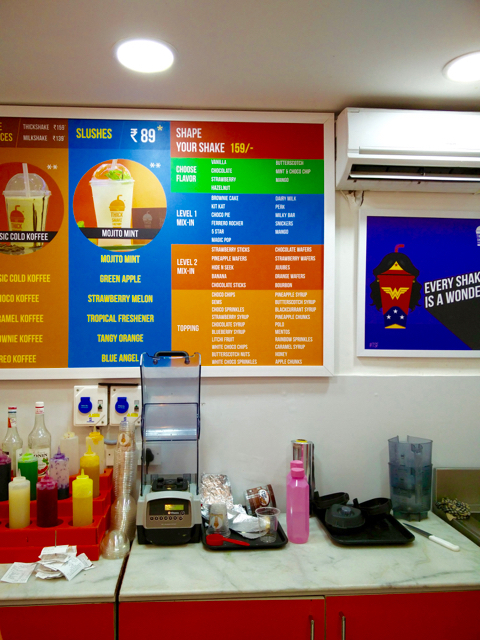 190, Thick Shake Factory on KNK road is a fantastic new addition to Chennai's grub scene. Unpretentious, clear goals and excellent shakes. I only wish they tweak their recipe a little bit to enhance their Level 1 mix flavours. I would have loved a little more choco-pie in my shake.